Similar to a custom banner, indoor our outdoor pop up canopy tents are an excellent way to catch the attention of all of the important people walking by your stand at trade shows, conferences or flea markets. Any season is a great time of year for businesses to set up custom canopies outside of their storefronts and connect with prospective customers. Whether your city or town is hosting a 5K run for charity, block party or flea market, these standard 10' x 10' outdoor pop up canopy tents are an innovative way to grab attention from passersby and prospective customers. Different from custom banners, custom canopy tents can keep people cool from the warm sun and out of the rain in case of inclement weather. With outdoor pop up canopy tents, your employees can still have fun representing your brand while protecting themselves from sunburns. At the same time, custom canopy tents are valuable marketing tents because we give everyone the flexibility to add their own personal touches! 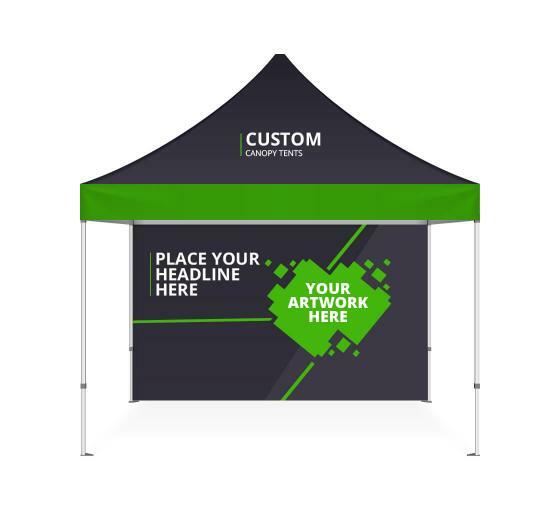 Add your company name and logo to your outdoor pop up canopy with BannerBuzz. Business owners have the opportunity to proudly promote their company at the roof of the custom tent canopy, and you have the choice to place the logo on the front or all sides. BannerBuzz also allows people to add graphics the walls on the right and left sides of the marketing tents if they choose to. This additional display can be extremely useful during annual conventions, conferences and trade shows. Your company will surely stand out among others if you decide to order one of our canvas canopies and marketing tents. At BannerBuzz, our custom canopy tents and marketing tents come with eight parts, making it very easy to assemble within a short time frame. We understand that our competitors may offer bulky, heavy canopies, our products are much lighter and easier to use! Weighing in at about 43 pounds, your team will be spending a lot less time setting up and more time building connections with potential clients or colleagues. Our custom canopy tents are an excellent way to provide shade during outdoor and indoor events. These marketing tents are a standard 10' x 10' size and are available in 7 colors. With a user friendly design, setting up this indoor or outdoor pop up canopy is quick and easy. Telescopic legs snap into place offering a range of heights.What will you put on your custom canopy tent from BannerBuzz? Get started today! These canopies are a standard 10'x10' size. Back wall: 117" x 79"
Half wall: 117" x 40.5"